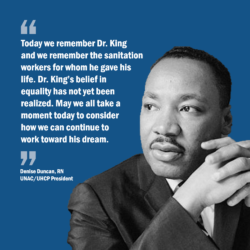 We remember Dr. King and the sanitation workers for whom he gave his life. “Fifty years ago, this country lost a visionary civil rights leader who fought for equality for African Americans. The magnitude of the loss is incomprehensible to this day. “Dr. Martin Luther King was in Memphis on the evening of April 4 to support black sanitation workers, members of AFSCME Local 1733 on strike. This fact is often overlooked. In fact, Dr. King’s connection to the labor movement was deep. The sanitation workers were fighting for basic human dignity. During the strike, Dr. King walked with them, asking Memphis elected leaders to afford them simple respect as fellow humans. The response, from Memphis and from police and the National Guard, was brutally violent. “The strike is considered a major milestone in the civil rights movement, not just because it proved to be Dr. King’s final campaign, but also because ‘I am a man’ went on to become a unifying civil rights theme. The slogan directly attacked the racist, infantilizing practice of white people referring to adult black men as ‘boy,’ which prevailed for decades across the Jim Crow south. “The strike was unquestionably a labor issue, but racism was a major factor in its genesis and escalation. Two black sanitation workers, Echol Cole and Robert Walker, were killed on the job, and the city wouldn’t even pay to bury them. While alive they had no pension, no workers’ comp or life insurance, no paid vacation and almost no health care benefits. They worked in filthy conditions, with no place to eat or clean-up. Their low wages kept them in poverty. And when it rained on the day of their death, they sheltered in their truck, where they perished. They stayed in the truck as the rain fell to avoid losing a day’s wages. The day prior, black sanitation workers had been sent home without pay during a rain storm while white sanitation workers were able to return to work after the rain ceased. For UNAC/UHCP’s series on the life of Dr. King, please click here.